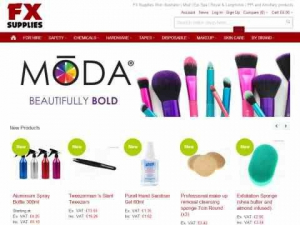 Part of the United Makeup Artists expo (www.umae.co.uk) family and started to help support its exhibitors by supplying their products throughout the year and not just at the show, we have created the Fxsupplies site to do this. Formed on the idea we should always strive to do better and drawing on a quarter century of experience in purchasing and product selection, our goal is simple, to help you source a quality product at a reasonable price. Loyalty and our ability for flexibility are key cornerstones to our business core. With this in mind we have introduced a loyalty point system that allows you to gain rewards when you spend. This gives you a change to save money as the more you spend with us the more you save. As you buy you earn rewards points. These points are added to your account which can then be redeem against future purchases providing you with a larger overall discount.